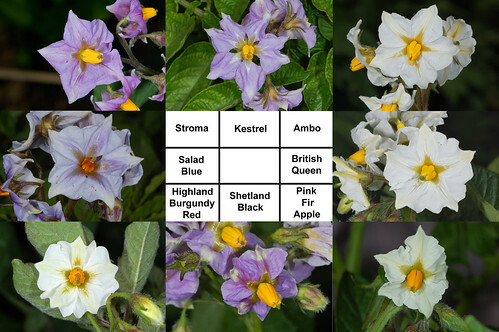 Paul has made a rather nice montage of the potato flowers, currently making a brave display. The Salad Blue are startlingly different, the British Queen munificently floriferous and I can detect a lovely perfume in the Shetland Black but I've had no confirmation of this from anyone else. If the writing is difficult to read, click through to Paul's flickr stream where it's clearer. So what's to be gloomy about? Not sure really. It's being a very bad season for ticks and I have been attacked more times than I've kept count of now. Apart from the ick factor ticks could be relatively benign, they don't hurt and they don't really take a lot of blood but they can carry a couple of very nasty diseases which can be difficult to diagnose or treat effectively. There is a huge amount of uncertainty about it all, does the tick have disease, has it been on long enough to have transmitted it, will the disease take hold, if the disease develops will it pass quickly or lurk in the system waiting to create havoc with joints, organs, even mental faculties? I'm at a low point and this is an added strain on my spirits. It doesn't help that there seems to be little or no information available about areas where disease is endemic. I discovered for example that it's possible to get Lyme disease from ticks in the Central London Parks but does that make it more or less likely in rural Normandy? There is no answer. There were in the region of 800 cases reported in the UK last year although experts estimate that there could have been as many as 3000 unreported. It is said to be more prevalent on the continent. About 15% develop complications, a small proportion of those life threatening. How many people were bitten and escaped unharmed is not known. Anyway, I'll keep checking and hoping nothing is attached to that part of my back I simply can't reach. The last attempt at elderflower champagne was, as expected, a failure It might have been the pectin in the sugar or the water being too hot or even leftover steriliser in the bucket (although I rinsed well!). With the small amount of natural yeast on the flowers it was almost certain that if something was wrong the brew would mould before it fizzled. Sadly, that was the case. There are just a very few elderflowers left fresh enough for another go. I managed to collect a handful of those opened in the last day or so and have tried again, this time with a lime in place of lemon because it was all I had to hand but at least the sugar is pure and the water had cooled properly. Fingers crossed. Rocket, about to blast off.